Polymer clay is very interesting material. It reveals the wide open spaces for creativity, so crafts made from polymer clay are very popular. There are many techniques to create crafts from polymer clay. 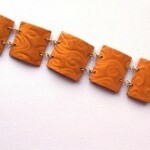 One of the more common basic techniques of jewelry called “Mokume Gane”. 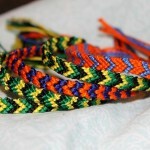 This technique is interesting because when you perform a few initial standard action, as a result, you can get a completely unique jewelry, such as bracelets made of clay. Two colors of polymer clay making cylinder (one color wrapped a layer of a different color). Squeeze or roll it, make several rows, the width of the resulting layer is equal to or slightly less than the width of the finished bracelet. Rolling tubes so that they tightly pressed together. With a brush cover Texture sheet with a thin layer of baby powder or talcum powder so that all recesses have been carefully sprinkled. You can also use water. Then carefully push for texture sheet to the formation of clay to figure turned as far as possible and clearly. Carefully remove the texture sheet and give stratum of clay to cool for half an hour. Then use the blade cut the speaker pattern. Better to cut slowly and gradually than to cut too much and spoil the ornament. Now with the help of cutters or blades cut the desired shapes. You can leave and solid bracelet, permitting the thickness of the reservoir. Then it is necessary to bake at the can. 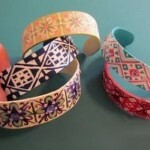 If you cut bracelet into pieces, it can be baked at the can or on a flat glass. Holes in parts can be done in wet clay using a toothpick or needle. You can also drill holes in the baked product. Finished parts if necessary, grind, and then coated with a glossy varnish. Gloss lacquer give gloss, semi – velvety. With the help of waxed cord collect our bracelet. 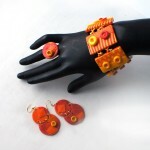 If you liked these homemade jewelry of polymer clay, then also look at this bright bracelet.